The art deco period was pretty much between the wars, starting around the mid 20’s. It was a product of the increased industrialisation of the day and a freeing up of ideas after World War 1. The art deco style is associated with geometric lines and strong shapes. It was influenced by Egyptian art from the time of the Pharaohs. In many ways the era can seem like a blend of absolute decadence and the macabre with dark tones in timber, onyx and chrome. Art deco engagement rings draw their design elements from the eclectic style of the era. In fine jewellery of course we work in precious metals and gemstones generally, so the resulting Art Deco engagement rings have a strong reliance on shape to produce the look of deco. The period of 20’s to early 40’s was a melting pot of new inventions: cars, aeroplanes, new building technology and general mechanisation… all strong themes for art deco to draw upon.For jewellery of the time, there was often an overlap of eras which makes Art Deco to some extent quite difficult to define precisely. It is one of those things in jewellery design where clear definition is sometimes elusive – just exactly where “art deco” starts and finishes is difficult to decide. 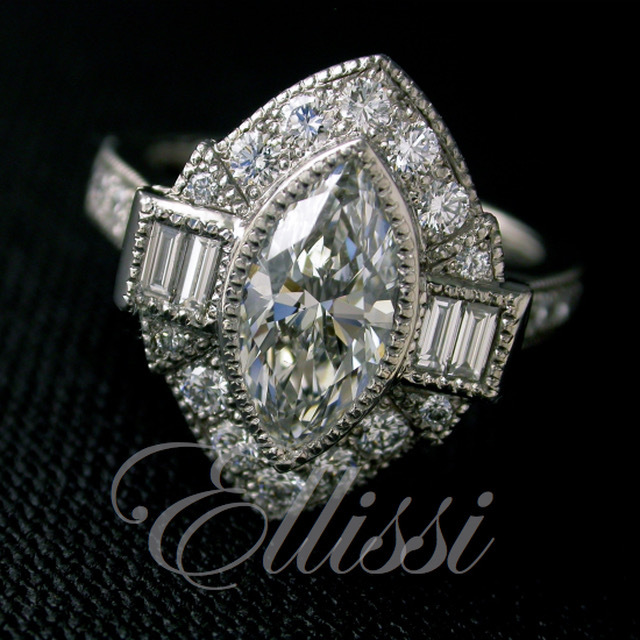 In this section of the ellissi site we have put together a selection of rings that we have made that share elements of Art Deco period. For some purists not all the designs here will be 100 % “deco” but of course that is the great thing about the marriage of art and design, especially in jewellery. There are few rules that must be adhered to – just designs you either like…or not, as the case may be. 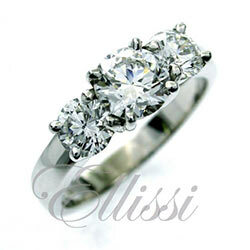 As we are custom ring makers, almost any design is possible for us to make. Please don’t hesitate to contact us if you have a design that you would like to discuss. “Tryphena” Trilliant Cut Ceylon Sapphire cluster ring. “Atria” Sapphire and Emerald cut diamond ring. “Eiffel” Unique design emulating the Eiffel Tower. 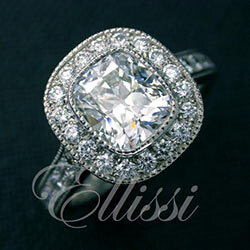 “Dione” cushion brilliant halo ring. “Juliana” Cluster with pink diamond detail.